On the morning of Sunday (25th) we left Sao Paulo via another long bus journey: 6 hours – and made it successfully to Curitiba. Curitiba wasn’t a city that stood out to us initially: it’s just commonly used as a quick 1 or 2 night detour instead of doing the whole hog of an 11 hour bus journey from Sao Paulo to Florianopolis. Having visited I can say it still isn’t a city that stands out incredibly, but in it’s own understated, unobtrusive and friendly way it’s a great place to visit and I imagine a lovely place to live. Curitba is renowned as Brazil’s most eco-friendly city and apparently the “greenest city on Earth”, host to some of the 2014 world cup. One of the amazing design considerations of Curitiba’s ecological side was that of the floodwater plans, in cities (especially in the America’s) you’ll commonly see huge concrete “rivers” flow through the city, designed to carry away large amounts of rain and ground run-off. 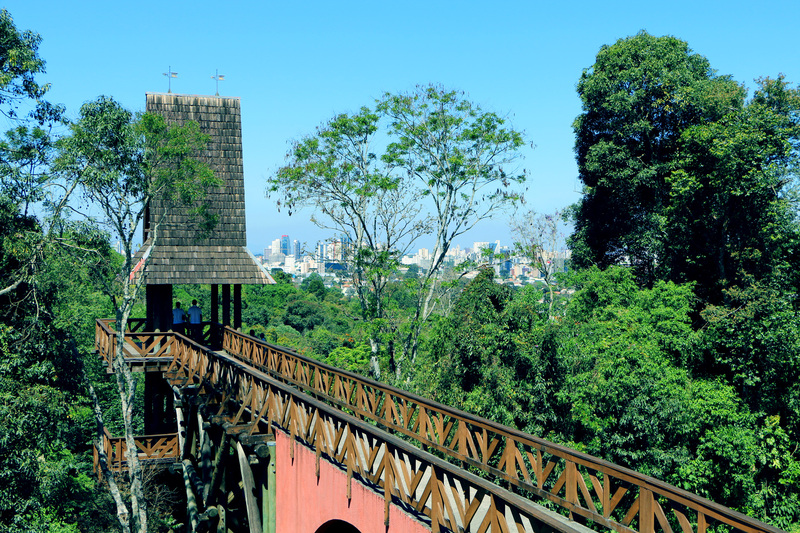 In Curitiba they had a different plan, instead they used and created green parks that were logically placed to follow the natural flow of the cities main rivers. In heavy rain these parks act as natural water run offs, providing the trees, plants and more with fresh water, and in extreme rain the low areas of the parks are even designed to act as natural floodplains! Understandably then there are notably more parks than any of the other Brazilian cities we’ve visited so far, and it’s not just the number, it’s the quality. Curitiba’s parks are lovingly designed with floral displays, well thought pathways, lots of bins, brilliant water fountains and more. There are even some incredible styled/themed parks with each one designed around some of the main ethnic groups that settled in Curitiba, such as the German “Hansel and Gretel” (Deutscher Wald / Bosque Alemao) gardens we visited, which had a very unique wooden tower, although the design of this was questionable, as I stood on one of the outreaching platforms and felt the thick wooden branches it had been built out of sway beneath me. Accompanied by Curitiba’s other incredible ecological boasting points such as it’s public transport accounting for ~80% of everyday commutes, a complete lack of favelas (unlike many Brazilian cities) which goes hand-hand with the cities cleanliness, thanks in part to its ingenious recycling and trash hand in program in exchange for previously mentioned public transport lead it to be a truly well thought out and lovely city to visit. It was also the first Brazilian city to pedestrianise a road! We were staying in a perfectly adequate though slightly pricey, private double room in the Hostel Motter, just outside of the old town district, from here we could walk – which we did on our first morning. 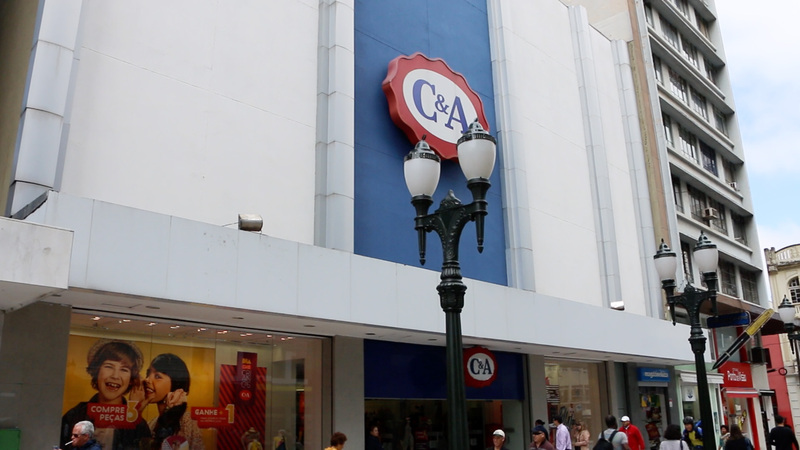 The town centre reminded me very much of a UK city from the 90’s — it even had a “C&A” shop! 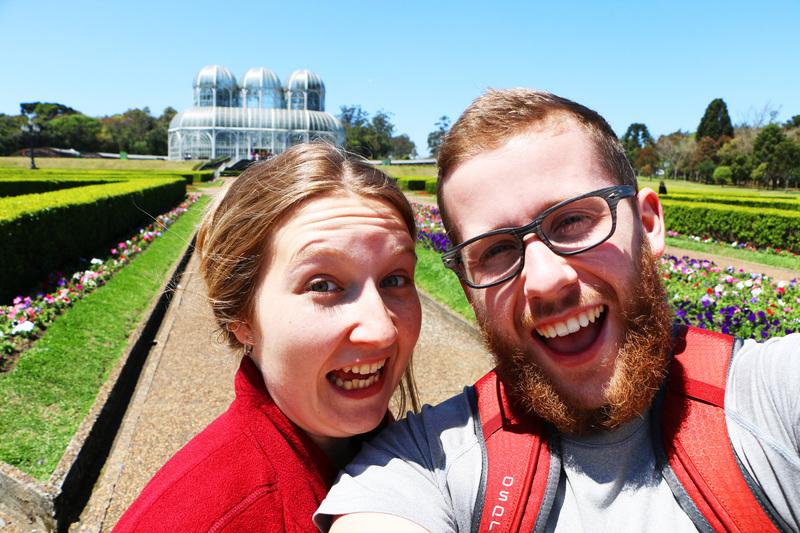 From the city centre we then caught a taxi to the Curitiba botanical garden’s (Jardim Botânico), a well designed group of gardens and lush green areas, engulfing a central greenhouse area. 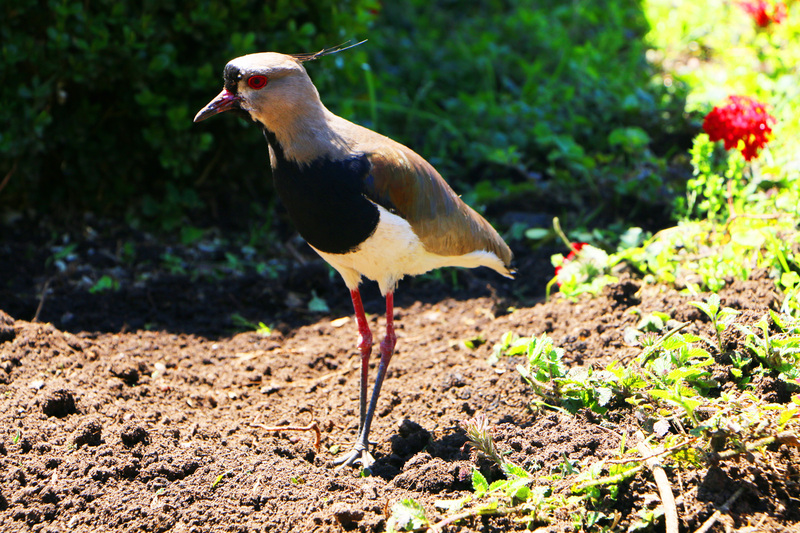 The gardens were dotted with odd birds we’d never seen before and simple but colourful local flowers. Inside of the large two storey, white iron framed greenhouse were tropical palm trees, a mini waterfall and plenty of odd plants that I’m sure botanist’s would adore. The botanical gardens were also free which was amazing! From here we Uber’d to the Hansel and Gretel park I mentioned previously and then walked our way around the upper areas of the town to another park which on my map stated “public drinking water”. Once there I noticed a vast amount of 10 gallon drinking bottles being filled from one of the taps that ran from a fairy tale-esque moss covered wall, with an ugly government sign above stating that this water was not for human consumption (in Portuguese). I thought this was ironic so was about to take a photo when a woman came over and started talking to Alis and I in Portuguese, we tried to say we didn’t speak the language, but obviously not well as she carried on for 5 minutes. After realising she was getting no replies to her questions she said “Esponal?” with a confused face, to which we retorted “nao”, “English?”, “si!”. She then called over her son who could speak perfect English and he then got chatting with us and gave us the 30 second version of what his mother had just said. Basically that for as long as he can remember his family have been getting water from this spring, but a government change several years ago led to these signs being placed, and apparently it is because to a certain degree the new government is sponsored by a bottled water company! We continued chatting for a while; anything from the UK leaving the EU, to Trump, to the history of Wales and the Celts, he even gave us his WhatsApp details and said if we get stuck or need anything to give him a message! It is moments like these, going to areas that locals visit and hearing their stories that really make travelling a complete joy. For those 5 minutes whilst the lady was talking to us in alien language both Alis and I felt like we must be unwelcome or something, we realised how completely wrong we were for thinking like that when the son translated everything. So often when we see people speaking an alien language it feels as though they’re talking about you or something else negatory about tourists – however the more and more we have moments like this we realise language is just a barrier to be ignored and for the most part everyone likes everyone when barriers are broken. It definitely reminds me of the kind of racism’s Britain faces; often because different languages are spoken, or different customs are used which feel alien, it creates animosity, deep down we’re all just the same with different ways of portraying ourselves. Other than that it was just a welcome break after the ridiculousness of Sao Paulo! We’re now in Florianopolis which is incredibly beautiful with lapping tides on golden sands that feels like silk beneath your feet. The wifi is not great here so uploading images/videos is proving to be difficult. But we’ll be somewhere new on Friday! I told Alis that a note pad is a handy thing to have with you. Drawings work well as long as you can draw !!! !